OMG Salted Date caramel & peanut butter are a killer combo, let’s talk about it! Don’t you love salted caramel ? 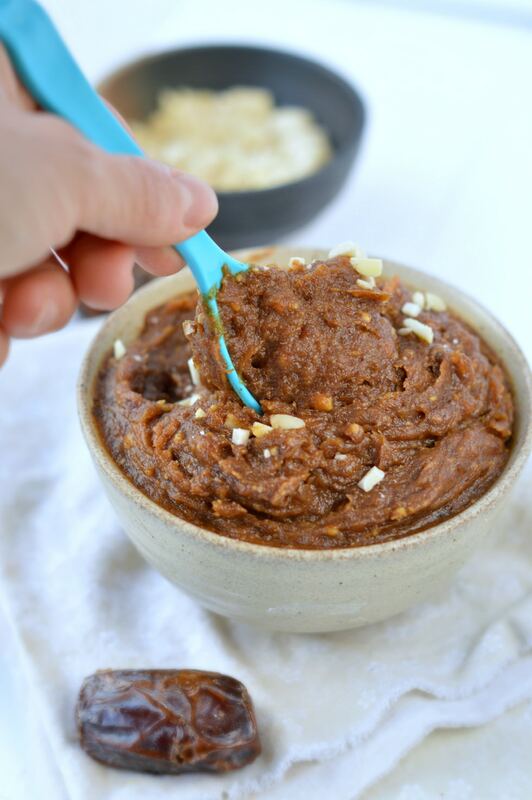 Seriously, if you do you will never live another day without this 3-ingredients salted date caramel & peanut butter spread! YES! it is a healthy, pure and natural spread – friendly for you my vegan friends! It is absolutely delicious A.N.Y.W.H.E.R.E! I use this as a topping to ice cream, on crispy warm wholegrain bread toast or even into plain yogurt. Really, French people are completely crazy about sea salt caramel – so as a French girl I am obsessed with salted caramel too – but it has been a while since I ate a French salted caramel recipe. Simply because it is loaded with everything I hate now: lots of butter and refined sugar. NO way I eat this as I am a crazy clean eater for 3 years now. So here I created my version of an healthy salted caramel spread. It is a simple, healthier recipe made in 5-10 minutes in a food processor with only 3 ingredients! Yep, you guys know how I love quick and easy recipes to fix my sweet cravings 🙂 This one is definitely THE fastest recipe that I prepare in the afternoon to fix my sweet afternoon cravings. Usually, I love to eat this date caramel spread with slices of apples to avoid the extra carbs from bread. BUT, I must convince this is a killer breakfast spread too if you spread this date caramel onto warm toast, pancakes or crepes! WAOUH! It is heaven! SO as I don’t like to make my recipes boring I added a generous amount of crunchy natural peanut butter in this caramel date spread. Seriously this really had something special to this spread. It brings it to the level of excellence. It is not only a sweet sticky caramel but also a crunchy nutty spread. OMG! I think this is the best breakfast spread I actually EVER made! It contains all the taste and texture I love. SO now, you have to make this cause really only 3 ingredients and 10-minutes max. There is no reasons to wait more. And you know what? 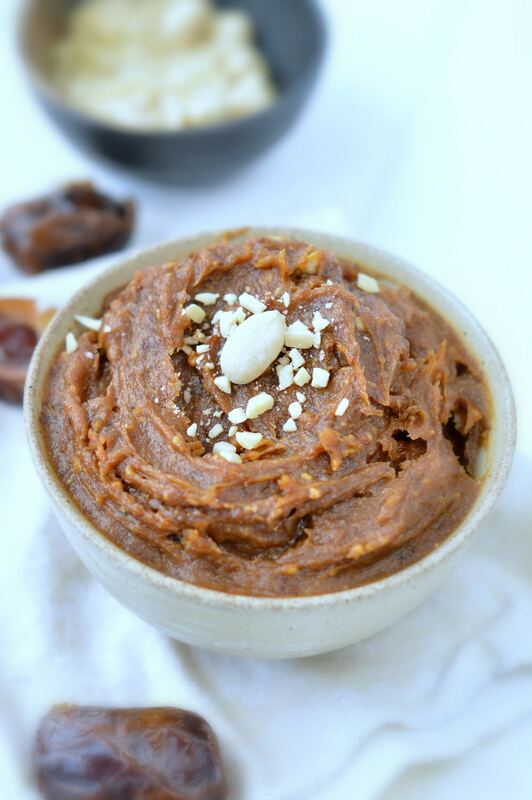 You can store this caramel date spread for up to 3 weeks in the pantry! I used sealed glass mason jars to store mine. OH! 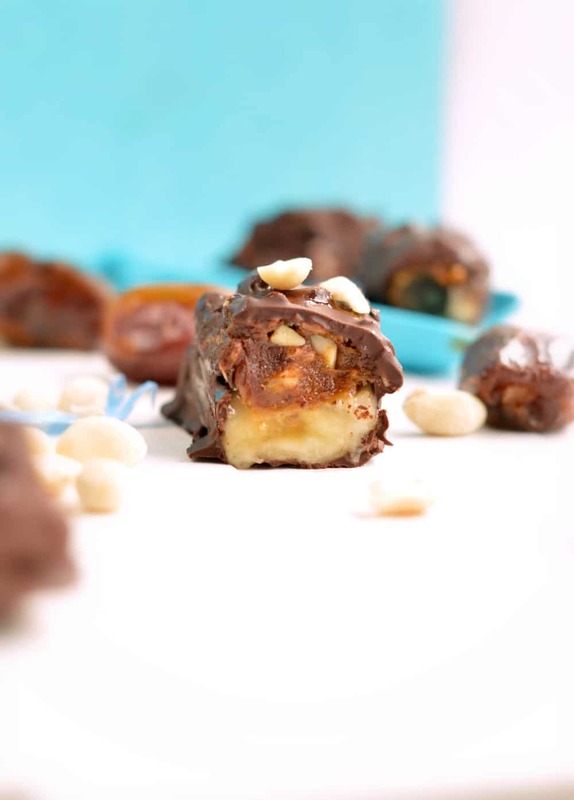 and if you love snickers candy bars heads-up to this recipe on the blog! You can actually use this caramel date spread to make simple & delicious Snickers Candy Bars ice cream! SUCCESS CLEAN EATING IN JUST 2 WEEKS ! Are you ready to reduce the amount of processed food you eat? Want to lose those extra pounds to feel good? 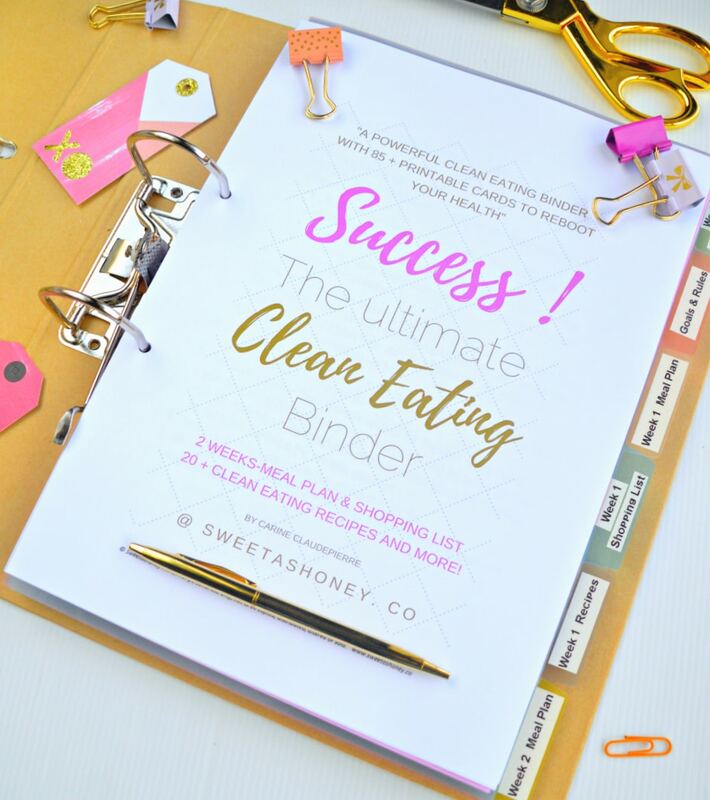 Success As you can see my ebook contains all the organisation sheets you need to Success The Clean Eating Diet in Just 2 Weeks no matter How Busy you are ! is a collection of more than 85 printable sheets* to successfully start a clean eating diet and reboot your health no matter how busy you are. Now, tell me what’s your favorite spread for breakfast ? Place the pitted dates in a bowl. Cover with boiling water and soak for 5 minutes. 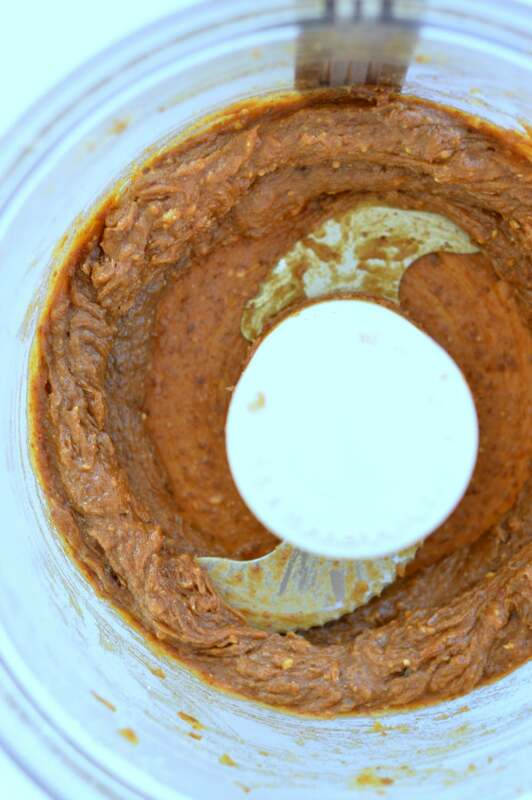 Drain and place the dates into food processor with the peanut butter and salt. Process until thick, creamy and smooth. I recommend to process 30 seconds, stop and scrap down the sides with a spatula then process again 30 seconds. Repeat this process until the date caramel is smooth and no more lumps of dates appears. Store in a sealed glass jar for up to 3 weeks in the pantry. Can be used as a spread on toast, crepes pancakes or to flavor yogurt.